Iwan Bala, one of the most inventive of artists in Wales, brings to his work that continuing engagement with words in both languages and his appropriated icons of Welsh identity which have characterised his paintings for more than a decade: his “wise words” illuminate and interrogate the means of “naming places”. Prof Tony Curtis. Introduction to: “Open Books. Sixteen Artists and the Chinese folding-book”. Recently my work has been based on words; words of Welsh language poetry. An exhibition, ‘Field-notes’ is currently on tour in which I collaborated with the poet Menna Elfyn. 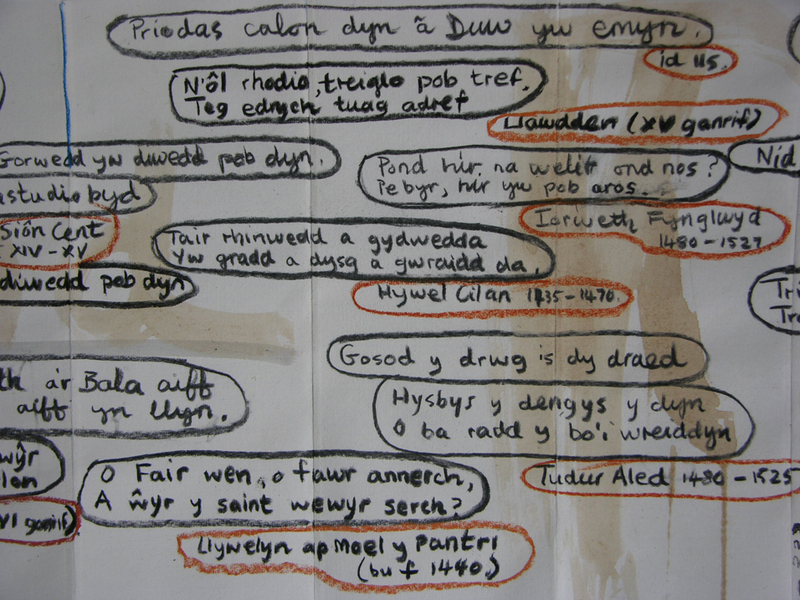 This led to my investigating the history and tradition of Welsh poetry, and in the book, I have written fragments of poetry, a sort of ‘time-line’ of poetry – most of which seems heavily weighted with a sense of loss and ‘hiraeth’. Most of these fragments I found amongst my late fathers books, often underlined. Over centuries, poetry in Welsh has been a means of coping with loss, even transforming loss into something transcendent and glorious. Hymns also, can be read as love poems, some of the most uplifting and poignant declarations of love in any language, and very difficult to translate. Writing these words into art-works are an attempt to preserve them and pass them on. The writing is deliberately raw and un-ornamented, like graffiti, or words scrawled onto a blackboard or on the pages of a notebook. The title of the work refers to a poem by contemporary poet, Myrddin ap Dafydd, which is also reproduced and translated (by Tony Conran) in the book itself. The poem is a response to a comment made about language being ‘nothing but words’. He goes on to prove that this is far from true, that a language describes our moods and feelings about the material and spiritual world, it is how we ‘recognize’ that world. Words define us today in the same way that all those centuries of poetic creativity have shaped the character of the people it was written for.